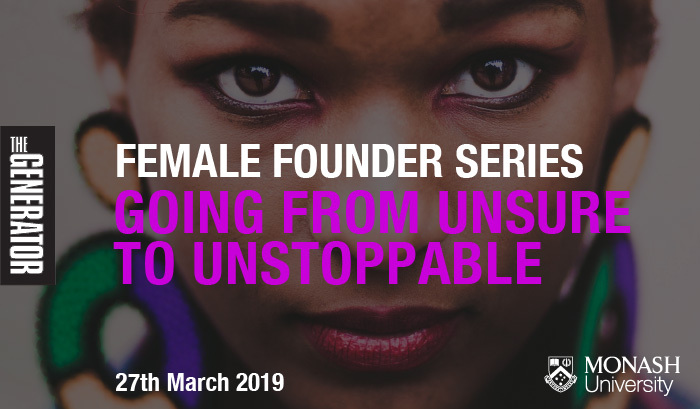 Join the Generator for the first of their Female Founders Series of 2019 as we explore how to go from being UNSURE to being UNSTOPPABLE. In this interactive workshop, you will hear stories from young female startup Founders on the challenges they faced when launching their own startup, as well as take practical steps to overcome your own barriers. This workshop is for anyone at Monash who has experienced the internal voice of doubt when wanting to try something new. Maybe you’ve doubted putting your hand up for a leadership position. Perhaps you didn’t know how to convince others of a new idea or innovation. Or you’ve resisted pursuing a side-project or startup idea because it seems like it’s off track from getting a job. We want to bring together like minded individuals who share a core belief that everyone is capable of achieving great heights. While this series is focussed on Female Founders, we welcome participation from the entire Monash startup community, regardless of gender or identity, who all believe in equality and equal opportunity. Join The Generator for this highly interactive workshop where you will be in a safe space to learn from others, share your experience, and most importantly, realise you are UNSTOPPABLE at being the best version of yourself. Plus there'll be time for networking over a bite to eat. Nikita Fernandez - Nikita was part of the 2018 Accelerator cohort as the Co-Founder of Career Futures, an education platform to help graduates navigate their career progression. Jocelyn Wardle - As Co-Founder of Internash, Jocelyn came through the 2018 Accelerator program having already developed a highly successful YouTube channel for international student looking to study in Australia. Leveraging the 100’s of thousands of views from their channel, Internash are developing support services for international students arriving in Australia. Eliza Li - Eliza is a current Biomed and Commerce student at Monash University and launched FEMI in 2018 as part of the Accelerator program as a personalised subscription model for women suffering with effects of menopause. If this resonates with you, we'd love to see you on 27th March at 6pm. Just grab your tickets so you don't miss out.